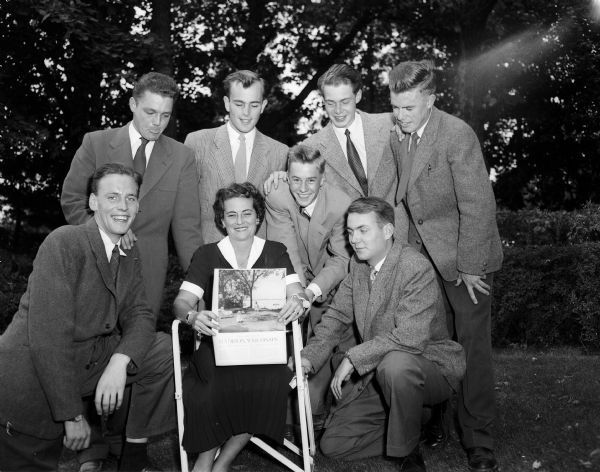 Seven students from Sweden, Denmark, and Norway and Margaret Brittingham, wife of Thomas Brittingham, Jr. pose for a portrait outdoors. The students are attending the University of Wisconsin for a year and living the life of a university fraternity man. Thomas Brittingham started the Brittingham Scholars Viking Program in 1952 to bring Scandinavian students to the University of Wisconsin. They are looking at the "Life Magazine" article of September 6, 1948, which describes the good life in Madison. Thomas Brittingham Jr. died April 16, 1960. The Brittingham Scholars program, founded in 1952 continued through 1962. Published in the Wisconsin State Journal September 19, 1953.